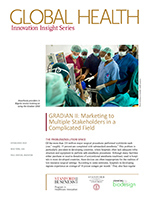 This post explores how Gradian Health Systems is tackling the challenge of marketing its Universal Anaesthesia Machine to four distinct but interconnected stakeholder groups: users, hospitals, Ministries of Health, and donor organizations. It was written by Julie Manriquez, Lyn Denend, and Professor Stefanos Zenios of the Stanford GSB’s Program in Healthcare Innovation. Of the more than 230 million major surgical procedures performed worldwide each year (1), roughly 15 percent are completed with substandard anesthesia. (2) This problem is particularly prevalent in developing countries, where hospitals often lack adequate infrastructure and equipment to perform safe anesthesia procedures. Although many facilities either purchase or receive donations of conventional anesthesia machinery used in hospitals in more developed countries, these devices are often inappropriate for the realities of low-resource surgical settings. According to some estimates, hospitals in developing regions experience an average of 18 power outages per month. (3) They also face regular shortages of compressed medical oxygen. Either of these problems will cause conventional anesthesia machines to shut down (4), creating devastating consequences for patients. Moreover, when conventional equipment malfunctions or breaks, hospitals in low-income settings frequently cannot get replacement parts and/or have no one qualified to perform the necessary repairs. After testing the UAM at his hospital in Malawi, Fenton sought to expand production. However, it took him more than a decade to line up the funding and support necessary to bring the idea to market. In 2009, Fenton joined forces with the Nick Simons Foundation, a private philanthropy supporting the Nick Simons Institute, which trained health workers to address needs in remote areas of Nepal. (6) The foundation provided seed funding to further develop and test the UAM. Based on the positive results of those studies in the U.K. and Nepal, the Nick Simons Foundation spun out an organization it called Gradian Health Systems to produce and commercialize the UAM on a global basis. Gradian generally was perceived as a good value in both product categories—the company offered a high-quality product at a competitive price. The UAM was CE certified and manufactured according to ISO quality standards. Gradian further distinguished the product from other companies working in the space through its commitment to comprehensive training and service, made possible by funding from the foundation. The challenge was that Gradian’s small team had to market and sell the UAM to four distinct but interconnected stakeholder groups: users, hospitals, Ministries of Health, and donor organizations. The direct users of the product were the anesthesia providers who, in the developing world, were often not medical doctors. Instead, they were mid-level health care practitioners with specialized (although sometimes minimal) training in basic anesthesia delivery. These providers personally experienced the challenges created by the unreliable and unsafe equipment used in low-resource operating rooms. They were perhaps the easiest to convince of the UAM’s benefits but, as Frenkel pointed out, “They’re not the ones with the resources or decision-making power.” Those with the ability to make purchasing decisions resided at the hospital or Ministry level. However, a significant percentage of facilities and Ministries in the developing world were severely resource constrained, with operating budgets that could not accommodate regular capital investments. To acquire new equipment, such as anesthesia machines, many hospitals depended on nongovernmental organizations (NGOs) or international donor organizations to make these purchases. Decision makers within these organizations were furthest from the problem and sometimes lacked adequate information about the needs and constraints of the facilities they intended to serve. “The users and hospitals that know what they need are often not even involved in the decision-making process for the equipment that they’re going to get,” Frenkel said. Complicating matters further, Gradian realized that the timing of anesthesia machine sales was important. “A hospital may buy one anesthesia machine this year and not purchase another for three years or more. So how do we identify and reach these folks before they make a decision?” Frenkel questioned. Gradian had managed to get sales of the UAM off the ground mostly through referrals. “To date I would say our marketing has been primarily word of mouth,” Frenkel stated. “We have bid on a couple of tenders. But so far we’ve really relied on NGOs that have heard about the product and come to us, or we’ve ‘cold called’ them and it has just worked out. But clearly that’s not a scalable marketing plan.” Gradian needed a comprehensive strategy for tackling these challenges. In parallel, the company would actively seek to expand its network of “champions”—highly respected users and hospital personnel who had direct experience with the value that the UAM delivered—in Gradian’s target geographies. These advocates were unpaid, but passionate about improving anesthesia safety in their countries. As such, they could be engaged to answer questions about the UAM and share their experiences with other users and hospitals, either on their own or at Gradian’s request. As Frenkel put it, “It’s very influential and boosts our credibility in the sales process when we’re not the ones saying that it’s a great machine.” Moreover, with a small team, Gradian could not be everywhere at once. “Our champions become our spokespeople, or an extension of us on the ground,” she added. Another way that Gradian would involve users was to engage with them through medical conferences and professional society activities. “Even though their voices are quiet in the grand cacophony of bureaucratic decisions like these, the end users need to be heard,” Frenkel explained. “We certainly can’t go to every hospital in Africa,” she continued, “but through conferences and events we can reach large numbers of potential users.” For instance, Gradian had recently attended the conference of the Kenyan Society of Anaesthesiologists, where it was able to demonstrate the UAM to numerous anesthesia providers from the area. The team’s hope was that these users would start asking for the device when they returned to the hospitals where they worked. Gradian also used these interactions as a way to gather user feedback. “They help us understand the anesthesia community’s needs and interests,” Frenkel stated. While all four constituencies stood to benefit from the UAM, each one had slightly different needs or “pain points” that the device would help address. The Gradian team worked to carefully understand the differences between its stakeholders’ points of view and then created marketing messages and materials that were tailored to each group “We developed a whole cadre of collateral that we used to speak to the different constituencies,” said Frenkel. These materials were used to broadly raise awareness among users, hospitals, Ministries of Health, and governments/NGOs. In an effort to win more contracts for large-scale government and NGO orders, Gradian invested significant time and energy into better understanding the tender process and how it could optimally present the UAM in its proposals. “Part of it is understanding how the decision-making processes work for these major organizations,” Frenkel said. Another key aspect was raising awareness among these entities that affordable, appropriate technologies like the UAM even existed. To assist the company in this area, Gradian hired an outside consultant “to help us learn how to really speak to these types of organizations,” she noted. To reach high-volume purchasers outside the tender process, Gradian planned to develop a list of the wide variety of organizations that made purchasing decisions for individual hospitals. For example, “In Malawi, we targeted a number of organizations that we had worked with, and in Uganda we’re starting to get a sense of organizations that train users but also fund equipment,” Frenkel said. The Gradian team gathered information about these organizations and also started tracking what it could about their purchasing cycles so that a team member could approach them at an appropriate time. “The idea is to get ahead of the organizations, before they make a decision about anesthesia equipment, so we can make them aware of the UAM, begin a dialog, and answer their questions,” she explained. In 2012, Gradian was implementing this approach to help the company address its marketing challenges. “It’s like a huge knot we’re trying to untangle,” Frenkel described. “I wouldn’t say by any stretch of the imagination that we’ve solved it, but we’re working on it.” So far, the early phases of this plan had enabled Gradian to expand the sites where the UAM was being used from 2 to 11 countries. (1) T.G. Weiser, et al., “An Estimation of the Global Volume of Surgery: A Modeling Strategy Based on Available Data,” The Lancet, July 2008, pp. 139-44, http://www.ncbi.nlm.nih.gov/pubmed/18582931 (September 13, 2012). (2) The Challenge, Gradian Health Systems, http://gradianhealth.org/the-challenge (September 17, 2012). (5) “Birth of the UAM,” Gradian Health Systems, http://gradianhealth.org/case-studies (September 17, 2012). (6) Company, Gradian Health Systems, http://www.gradianhealth.org/company (September 17, 2012). (8) All quotations are from an interview with Erica Frenkel conducted by the authors unless otherwise cited. This entry was posted in Sales Marketing and Distribution, Uncategorized. Bookmark the permalink.